As every new platform is released, the focus is always put on its most efficient part - the top-end processors and chipsets, normally in combination with "extreme" memory modules and powerful 3D accelerators. But will the average user have enough means to buy such a "monster" PC? Most likely not. Also, such a high performance with its increased power consumption is not always needed. When assembling a "workhorse" PC or a multimedia center, which are most frequently assembled and high-end components are not a must, they normally choose something inexpensive, reliable and offering sufficient performance. So today we are talking just about a platform like that. Migrating its CPUs to the new AM2 sockets with its new memory controller able running with DDR2 memory, AMD has not ignored the budget processors. Sempron CPUs have officially acquired a dual-channel memory controller which is able running with the faster DDR2-400/533/667 memory. It's just these processors which soon should come as a replacement for "budget" platforms: the official Socket 754 and unofficial Socket 939. It is easy to note that Socket AM2 CPUs have acquired higher PR ratings with the same clock speed limit. Perhaps these ratings were calculated on the assumption that the faster DDR2 memory will affect the performance positively. But prior to finding out if that is the way in practice, let's look at the exterior of the new CPUs, starting with the package. The CPU is shipped in a cardboard package of customary green color. 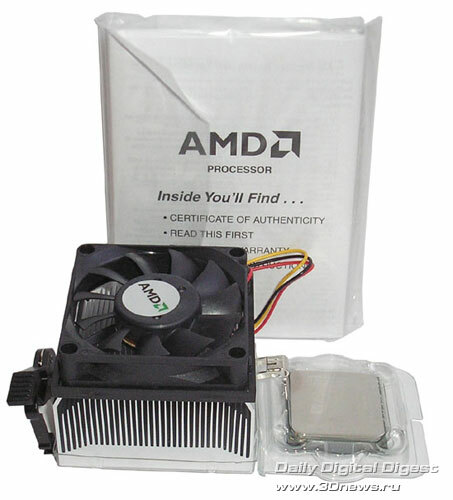 On the side, there is a window through which the buyer can view the CPU and its marking. Inside the package, we found the following: the CPU, the renewed cooler (with a fastener for AM2), a user's manual, and a logo sticker. Externally, the renewed processor makes little difference from CPUs of the previous generation. The difference can be seen from only the marking which now looks as SDA3000IAA3CN. The marking can be read as follows: SDA – Sempron for workstations, 3000 – the CPU rating, I – type of the packaging: 940-pin OµPGA (Socket AM2), A – varying supply voltage of the core (probably 1.25-1.35 V), A – the variable maximum admissible temperature, 3 – the L2 cache size 256 K, CN – the Manila core. A more precise data can be displayed with utilities. The Socket AM2 processor viewed from the bottom is easy to distinguish if we closely examine the positioning of pins. Have you found a redundant pin? On the photo, it is in the bottom-left corner of the right-hand processor. Here is the complete info summary of the processor being tested produced with the CPU-Z utility. 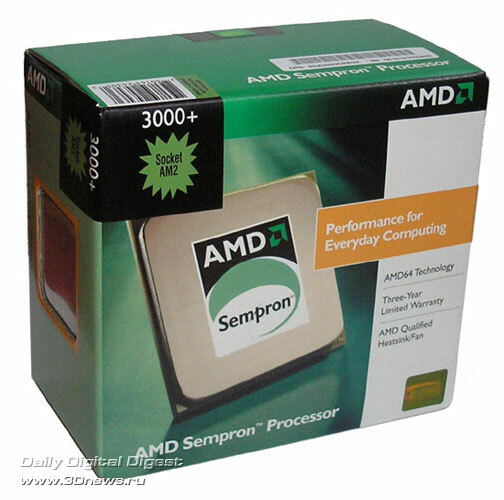 For comparison, we also bring in the info on AMD Sempron for Socket 939. Before we run the tests, a few words on the overclocking. Overclocking on the test bench was not in success, because the motherboard did not allow changing the multiplier of the HyperTransport bus. The result proved rather modest – merely 1745 MHz. But on the motherboard ASUS M2N-E the result proved better – the stability limit 2080 MHz with a nominal cooler. It is interesting to note that raising voltage on the core has not resulted in anything – we failed to improve the overclocking, and the CPU was heating up to 63°С instead of 56°С under standard supply voltage. First, we thought it was the motherboard to blame for, but now it is the test sample because the CPU should offer higher overclocking capability and heat up less. We ran the tests in several stages. Since the processor is aimed at value systems, the motherboards that we used were chosen those offering onboard video - let's see what acceleration of the memory subsystem and video memory will give. Now move on to the external video. As can be seen from the first synthetic tests, the faster RAM and increased size of the L2 cache don't make up for the reduced clock speed. Now move on to the practical application of computing capabilities - the faster, the better. Again we can see a lack of the CPU clock speed - it is evident that overclocking starts improving the situation. Moving on to gaming synthetics and games. There aren't any serious changes - the loss is in some ways greater, somewhere it is less, but it is anyway a loss. AMD's rating system glitches – reduction of the clock speed can hardly be made up for without architectural changes. Anyway, since the new processors were compared first by ratings versus the single-channel Sempron for Socket 754 which are a bit slower than for Socket 939, we can somehow justify the rating system. Let's see how the result will change if we disable the integrated video and enable external video – we install Inno3D GeForce 6600GT 128 MB GDDR3. At first glance, replacement of the video has not brought any changes, but the system on the base of Sempron AM2 ran more confidently in video tests. Accelerated operating of graphic applications due to the use of faster RAM is seen already in SPECViewperf 9.0 suite, but we need a powerful video card. Futuremark's 3DMark suites also demonstrate accelerated handling of graphics, but they try to create a minimum load on the CPU, unlike that in popular games. Once the load on the CPU starts going up, the results quickly tend to those previously produced. But before we make final conclusions, let's investigate one more aspect – the need of Sempron AM2 processors for the RAM bandwidth. To this end, using the BIOS settings we turned DDR2-667 into DDR2-533 and DDR2-400, with the latency timings set as per SPD. The most noticeable performance leap occurred due to transition from DDR2-400 to DDR2-533. The former is already rarely available in the retail, and the latter is not much cheaper than DDR2-667. It turns out that if you are into saving without much loss, the most optimum will be use of DDR2-533 modules. Having summed up all the test results, we note that we expected more from Sempron CPUs for Socket AM2 but the miracle hasn't worked and we got a bit less than that. AMD has overdone with ratings – honestly, to produce a true comparable result, 100 units of the rating for each model should have been deducted. Anyway, there is no reason to worry especially if you are short for funds - there is no drop in performance, the CPUs will allow for a comfortable work and even play if a good video card is installed. At the same time, prices for Sempron AM2 are traditionally affordable, faster and cheaper RAM is used, and a system assembled on the base of Socket AM2 is open for future upgrades. Генерация страницы: 0.036 с. Всего 8 запросов к базе.